If you missed the ‘about me‘ page, I am a freelance writer and English language graduate from the Open University. Below, you will find a selection of my published magazine articles. I provide online content, proof read and rewrite existing content, as well as ghostwriting a wedding blog. If you would like to see further samples of my work or have any questions, please get in touch – msoliviafitz@gmail.com. During our gloomy winter, I was in desperate need of some sunshine so I indulged myself to a few days in La Palma and Tenerife. In my blissful ignorance on account of never having travelled to either of the Islands before, I had only anticipated the guaranteed sunshine and was unsuspecting of how many delights lay ahead. We arrived at Tenerife South airport in the afternoon and got things started immediately with a guided walking tour of the historic quarter of the world heritage site, San Cristobal de La Laguna. The former presence of royal power and influential families is evident in the impressive architecture, with their beautiful stone facades and finely carved Canarian pine details. After a leisurely lunch of traditional Canarian fayre at the hotel Laguna Nivaria of grilled cheese, dried salted fish, and a barraquito (coffee made in layers of condensed milk, cream, rum and cinnamon), we were transferred to the smaller, North airport to board the short half-hour flight to La Palma. 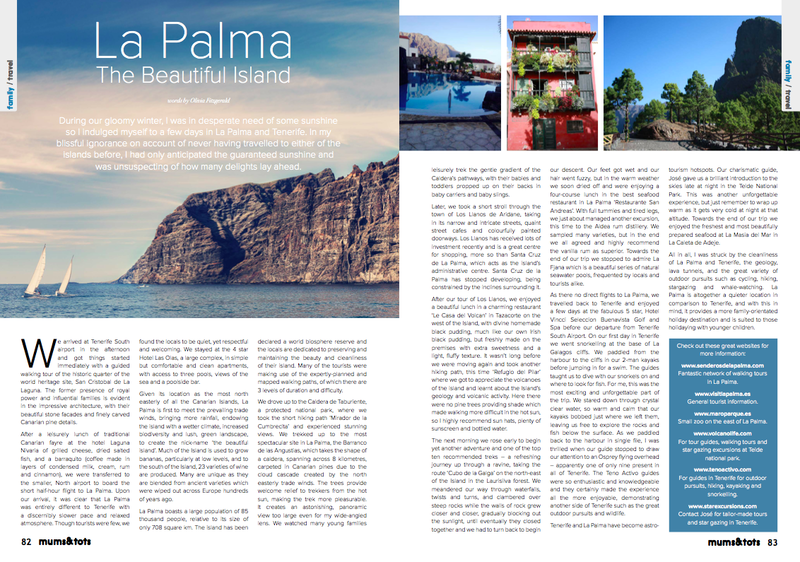 Upon our arrival, it was clear that La Palma was entirely different to Tenerife with a discernibly slower pace and relaxed atmosphere. Though tourists were few, we found the locals to be quiet, yet respectful and welcoming. We stayed at the 4 star Hotel Las Olas, a large complex, in simple but comfortable and clean apartments, with access to three pools with views of the sea and a poolside bar. Given its location as the most north easterly of all the Canarian Islands, La Palma is first to meet the prevailing trade winds, bringing more rainfall, endowing the Island to with a wetter climate, increased biodiversity and lush, green landscape, to create the nick-name ‘the beautiful island’. Much of the Island is used to grow bananas, particularly at low levels, and to the south of the Island, 23 varieties of wine are produced. Many are unique as they are blended from ancient varieties which were wiped out across Europe hundreds of years ago. La Palma boasts a large population of 85 thousand people, relative to its size of only 708 square km. The Island has been declared a world biosphere reserve and the locals are dedicated to preserving and maintaining the beauty and cleanliness of their Island; all the vital qualities which make it an attractive and prime hiking destination. Many of the tourists were making use of the expertly-planned and mapped walking paths, of which there are 3 levels of duration and difficulty. We drove up to the Caldera de Taburiente, a protected national park, where we took the short hiking path ‘Mirador de la Cumbrecita’ and experienced the most spectacular views of the entire trip. We trekked up to the most spectacular site in La Palma, the Barranco de las Angustias, which takes the shape of a caldera, spans across 8 kilometres, and is carpeted in Canarian pines due to the cloud cascade created by the north easterly trade winds. The trees provide welcome relief to trekkers from the hot sun, making the trek more pleasurable. It creates an astonishing, panoramic view too large even for my wide-angled lens. We watched many young families leisurely trek the gentle gradient of the Caldera’s pathways, with their babies and toddlers propped up on their backs in baby carriers and baby slings. Later, we took a short stroll through the town of Los Llanos de Aridane, taking in its narrow and intricate streets, quaint street cafes and colourfully painted doorways. Los Llanos has received lots of investment recently and is a great centre for shopping, more so than Santa Cruz de La Palma, which acts as the Island’s administrative centre. Santa Cruz de la Palma has stopped developing, being constrained by the inclines surrounding it. After our tour of Los Llanos, we enjoyed a beautiful lunch in a charming restaurant ‘Le Casa del Volcan’ in Tazacorte on the west of the Island, with divine homemade black pudding, much like our own Irish black pudding, but freshly made on the premises with extra sweetness and a light, fluffy texture. It wasn’t long before we were moving again and took another hiking path, this time ‘Refugio del Pilar’ where we got to appreciate the volcanoes of the Island and learnt about the Island’s geology and volcanic activity. Here there were no pine trees providing shade which made walking more difficult in the hot sun, so I highly recommend sun hats, plenty of sunscreen and bottled water. The next morning we rose early to begin yet another adventure and one of the top ten recommended treks – a refreshing journey up through a ravine, taking the route ‘Cubo de la Galga’ on the north-east of the Island in the Laurisilva forest. We meandered our way through waterfalls, twists and turns, and clambered over steep rocks while the walls of rock grew closer and closer, gradually blocking out the sunlight, until eventually they closed together and we had to turn back to begin our descent. Our feet got wet and our hair went fuzzy, but in the warm weather we soon dried off and were enjoying a four-course lunch in the best seafood restaurant in La Palma ‘Restaurante San Andreas’. With full tummies and tired legs, we just about managed another excursion, this time to the Aldea rum distillery. We sampled many varieties, but in the end we all agreed and highly recommend the vanilla rum as superior. Towards the end of our trip we stopped to admire La Fjana which is a beautiful series of natural seawater pools, frequented by locals and tourists alike. As there no direct flights to La Palma, we travelled back to Tenerife and enjoyed a few days at the fabulous 5 star, Hotel Vincci Seleccion Buenavista Golf and Spa before our departure from Tenerife South Airport. On our first day in Tenerife we went snorkelling at the base of La Galagos cliffs. We paddled from the harbour to the cliffs in our 2-man kayaks before jumping in for a swim. The guides taught us to dive with our snorkels on and where to look for fish. For me, this was the most exciting and unforgettable part of the trip. We stared down through crystal clear water, so warm and calm that our kayaks bobbed just where we left them, leaving us free to explore the rocks and fish below the surface. As we paddled back to the harbour in single file in order to avoid the speed boats, I was thrilled when our guide stopped to draw our attention to an Osprey flying overhead – apparently one of only nine present in all of Tenerife. The Teno Activo guides were so enthusiastic and knowledgeable and they certainly made the experience all the more enjoyable, demonstrating another side of Tenerife such as the great outdoor pursuits and wildlife. Tenerife and La Palma have become astro-tourism hotspots. Our charismatic guide, José gave us a brilliant introduction to the skies late at night in the Teide National Park. This was another unforgettable experience, but just remember to wrap up warm as it gets very cold at night at that altitude. Towards the end of our trip we enjoyed the freshest and most beautifully prepared seafood at La Masia del Mar in La Caleta de Adeje. All in all, I was struck by the cleanliness of La Palma and Tenerife, the geology, lava tunnels, and the great variety of outdoor pursuits such as cycling, hiking, stargazing and whale-watching. La Palma is altogether a quieter location in comparison to Tenerife, and with this in mind, it provides a more family-orientated holiday destination and is suited to those holidaying with younger children. www.senderosdelapalma.com Fantastic network of walking tours in La Palma. www.maroparque.es Small zoo on the east of La Palma. www.volcanolife.com For tour guides, walking tours and star gazing excursions at Teide national park. www.tenoactivo.com For guides in Tenerife for outdoor pursuits, hiking, kayaking and snorkelling. www.starexcursions.com Contact José for tailor-made tours and star gazing in Tenerife. When I became pregnant, the decision to stop drinking alcohol was automatic. I was apprehensive during my pregnancy, so I stopped drinking entirely until the last trimester when I enjoyed the very occasional glass of red wine. At a friend’s wedding, I sipped a glass of wine, followed by only one more over the course of the day. Some of the other guests offered me alcoholic drinks regardless of my protests and rather conspicuous baby belly. This experience suggests there is confusion over whether pregnant women should drink alcohol and what amount is safe. I can accept that there are varying opinions among us on what is acceptable, but what I find worrisome is that the professionals can’t seem to agree either. Since my babies were born, some findings have reassured me that it was OK to have had the occasional drink and others have left me feeling guilty and confused as they advised to avoid alcohol entirely. Health departments and medical officers believe we should abstain from alcohol entirely for the duration of the pregnancy. The Irish Department of Health has made its position clear. ‘Given the harmful drinking patterns in Ireland and the propensity to binge drink, there is substantial risk of neurological damage to the foetus resulting in Foetal Abnormality Spectrum Disorders. Therefore, it is in the child’s best interest for a pregnant woman not to drink alcohol during pregnancy’. As well as a range of F.A.S.D, evidence has shown that the consumption of more than three alcoholic drinks per day increases the risk of miscarriage. There is also a strong correlation between heavy drinking and premature births. The number of pre-term births is highest among women who consume high amounts of alcohol. The Chief Medical Officer in the UK has also stated that pregnant women should avoid alcohol completely and the American Academy of Paediatrics reiterates this message. In spite of this universal standard, some Irish women continue to drink during pregnancy, and some at high levels. A study published in the BMC pregnancy and childbirth Journal reported that 10% of the 61,241 women surveyed at Coombe Women’s Hospital drank between 6-20 units of alcohol per week which is more than American and European Counterparts. Different studies report slightly different findings, but overall it is evident that Irish women are more likely to drink alcohol during pregnancy. 12% of women in the U.S. admit to drinking during pregnancy, 53% of French women, 55% of British women and in Ireland 66% of women admit drinking alcohol during pregnancy. However, the results of a small study – ‘Alcohol consumption in pregnancy’ published in the Irish Journal of medical science in 2013, suggests that our habits may be changing for the better. The survey of 240 women in the greater Dublin area, shows a decline in the amount of alcohol consumed by pregnant Irish women when compared to previous research. 62 % of those surveyed said they did not drink at all. This is in stark contrast to earlier research of 120,000 women carried out at Coombe Women’s Hospital during 1987-2005, which showed that only 28% of women abstained. Research findings may bring reassurance to some, but shifting goalposts may lead to confusion and misinterpretation of the guidelines. More recently there are medical professionals who say that small amounts of alcohol are unlikely to have any negative effect on the baby. In 2008, the National Institute for Health and Clinical Excellence said women who choose to drink ‘should be advised to drink no more than one or two units once or twice a week. Although there is uncertainty regarding a safe level of alcohol consumption in pregnancy, at this low level there is no evidence of harm to the unborn baby’. To add further complication, it has been acknowledged that many incidences of babies born with F.A.S.D may go undetected, and therefore the true impact of alcohol consumption during pregnancy is unknown. A longer term Danish study in 2012 found that women who reported moderate alcohol consumption (one drink per day) did not have a negative impact on ‘executive’ functioning in 5-year-old children (executive functioning refers to cognitive ability to plan, organize, remember details and manage time). New figures and research will continue to come forward with slightly different results and bring controversy to this ongoing debate. Whether we may deem it good or bad news, we can’t ignore the underlying message from national health departments which remains constant – drinking alcohol at high levels poses huge risks to our unborn babies and if we do choose to drink, it is safest to keep it to a limit of no more than one or two units, once or twice a week. 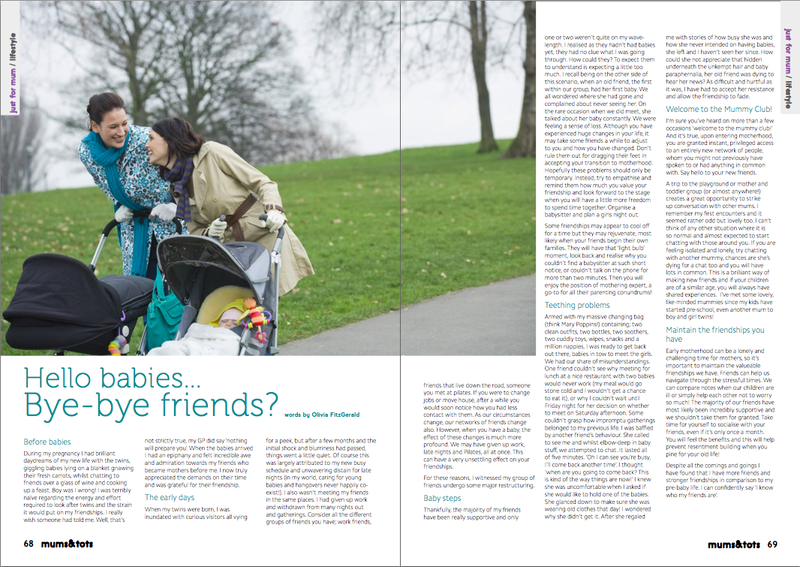 (Published in Mums and Tots Magazine, Spring issue 2014). I never had an imaginary friend during my own childhood. It wasn’t until my 4 year-old daughter caught the dreaded chicken pox and developed a special little friend that I began to worry if this was a sign of a healthy imagination, a lonely little girl, or possibly both. She appeared to contract a bad strain of the virus and was very unwell, missing two whole weeks of pre-school. During that time, we didn’t leave the house as she was feeling too tired and run-down. Within the confines of our home, I did everything I could to entertain her, but after a few days it was obvious that she was becoming bored and frustrated. One afternoon I arrived into the living room to sit down beside her on the sofa and I was quickly informed that I was squashing Sarah. ‘Who’s Sarah?’ I asked. ‘The big girl’ she answered with a look suggesting I really ought to know. I was both surprised and intrigued, but fought the urge to ask too many questions. For a few days we were graced with Sarah’s presence as she sat with us at the dinner table and we watched cartoons together. We were scolded on a few occasions for squashing her, but as the days passed Sarah was mentioned less frequently until eventually she was forgotten entirely. When my daughter first mentioned her new friend, I immediately began to engage her in new games and activities, thinking that her mind was lacking stimulation. Driven by concern and curiosity I decided to delve deeper and did some reading on the subject. Parents like myself may worry that the reason they have developed an imaginary friend is because they are bored, lonely or is indicative of a developmental issue, however I happily discovered that recent research does not support these notions. The development of an imaginary friend in childhood is normal, healthy and not uncommon. According to Marjorie Taylor of the University of Oregon and Author of ‘Imaginary friends and the children who create them’, just over two thirds of children will develop an imaginary friend by 7 years of age. The number of children with imaginary friends is much higher than previously thought. Marjorie and her team describe it reassuringly as ‘taking imaginative play one step further’. Marjorie’s research has helped disprove long-held negative beliefs and connotations regarding the mentality of children with imaginary friends, such as indicative of an emotional void or developmental anomaly. Instead they view it as a very positive and normal sign that a child is simply enjoying themselves. Marjorie is of the opinion that ‘very often adults think there is some deficit in a child’s life that sparks the creation of imaginary friends, but that isn’t necessarily true. The trauma of transition isn’t usually the main catalyst. It’s more often the free time that goes along with that transition’. Their research shows that children with imaginary friends are generally more extroverted and in no way is it connected to shyness or any form of maladjustment. Researchers are in agreement that children with imaginary friends are less shy, and enjoy laughing and spending time with their peers. It has also been suggested that they are more empathetic towards others. Some children are more likely to develop imaginary friends, such as in families where they are the only child, the eldest child and also those children who don’t watch much television. Children are more likely to develop an imaginary friend during the pre-school years (between 3 or 4 years of age) and girls are more likely to develop an imaginary friend at this age, but by age 7 the numbers will even out. Children who have time which is unstructured and with few or no play friends are more likely to develop imaginary friends. If a child is experiencing difficulties, having an imaginary friend may provide them some comfort (a possible example may be moving house, before the child has built new friendships). By themselves they are dealing with their fears and insecurities in their own way. These children, later demonstrate better coping strategies and can adjust more easily to new circumstances. They have shown to be highly creative with strong imaginations. Researchers have found there are many benefits for a child in having an imaginary friend and it is psychologically healthy. Having an imaginary friend provides a child with an opportunity to play and practise dialogue through role playing, and they can practise how to form and maintain friendships and how to express themselves. The relationship can boost a child’s confidence and it also provides them with an opportunity to practise conflict resolution. Children with imaginary friends have been shown to have a healthy self-image with regard to competence and popularity. Research by Karen Majors at the London Institute of Education has revealed that imaginary friends provide children with a safe and reliable companion during a period of their development when they are forming friendships for the first time. They also found that it provided an outlet to allow children to express anxieties and demonstrate their feelings. They discovered that the imaginary friends are not entirely forgotten and may reappear as they need them, or may be maintained secretly even up until their teenage years as a form of escapism or during difficult periods. Surprisingly, up to a quarter of children will keep their imaginary friends secret from their parents. Children have reported imaginary friends such as little birds that sit on the shoulder, an older child and even a tiny baby doll that fits in the palm of their hand. These imaginary friends are more likely to be more competent role models for the child rather than someone who gets blamed for naughty behaviour. Ongoing work at the University of Manchester lead by research assistant Roby has redefined the idea of an imaginary friend to encompass soft toys as children often assign personalities, traits, likes and dislikes to their toys. Parents like myself may worry about the reasons why their child has developed an imaginary friend, but the findings are altogether very positive and reassuring, demonstrating a child’s stronger emotional resilience, enhanced social skills and creativity. Children with imaginary friends have not confused reality with fantasy. When they are asked if their imaginary friends are real, the vast majority respond that they are indeed imaginary. Jon Faull, a developmental specialist says that parents should accept their child’s imaginary friend, and at the same time try not to encourage it. You shouldn’t try to make your child forget their imaginary friend as it is generally agreed that the child will maintain their friend for as long as they need to. As long as it doesn’t spill over and affect the development of friendships with their real friends, dominate their time, or result in lots of negative behaviour for which the imaginary friend is blamed, although this is very unlikely. Parents’ reactions to finding that their child has an imaginary friend vary from being extremely proud to very anxious. If you find that your child has developed an imaginary friend, there is no cause for concern. By asking questions you may help your child to reveal their worries and frustrations or what they love and enjoy. Psychologists agree that you should not discourage your child, and instead behave indifferently and simply allow the friendship to run its course. The majority of childhood accidents in Ireland take place within the home. In Ireland, deaths caused by accidents account for more deaths in the under 1s than from illnesses such as leukaemia and meningitis combined. Different measures will be required at the different stages of development. Initially, the essential measures should ideally be taken before your child begins to crawl. Then, their new-found mobility and natural curiosity will really put your baby proofing to the test. As they begin to walk and climb, new risks will present themselves at higher levels and new measures will need to be implemented. Careful observation of your child will help to alert you to new risks and new measures will need to be implemented. Stair gate, especially at the bottom of the stairs. Fire guard. This should be securely fixed to the wall, rather than a stand alone guard. Window latches and guards to prevent window being opened wide enough to allow child to escape. Curtain cord safety device to prevent strangulation, or replace cords with wands if they are not 1.6 m above the ground. Locked medicine box, well out of reach. Latches. Oven latch, boiler latch (if indoors), adhesive toilet latch, kitchen cabinet latches, especially for those containing bleach, detergents and dishwasher tablets. Baby walkers may give your child a sense of freedom and free you up to attend to chores, but these are discouraged by paediatricians and accident and emergency staff as they have witnessed so many injuries caused by accidents in baby walkers. In Canada, the sale or import of baby walkers is banned completely and the American Academy of paediatrics have strengthened their position and called for a complete ban also. Never leave a baby or child unattended in the bath, even if they are with an older sibling. Only an inch of water is enough for a child to drown. When filling the bath, always add the cold water first in case you drop the baby into the water. Use a rubber mat in the bath to help prevent slips and falls. Bath taps can be covered with rubber covers, again to prevent bangs and bumps. When you’re finished, always empty the bath right away, to prevent toddlers or older children from climbing back in. Bath plugs can be hidden to prevent them from running their own baths while your back is turned. Burns are the number one accident for children in the home, so extra precaution should be taken in the kitchen. When cooking, try to use the inner rings of the hob which are closest to the wall, rather than the outer rings, and always point pot handles inwards, making it more difficult for young children to reach. Never leave pots unattended. Cabinet latches are a great deterrent however some toddlers can figure out how to open them quite easily. With this in mind, consider changing to less toxic cleaning products, such as non-chlorine bleach and vinegar. Sharp knives, cork screws, skewers, peelers and graters should be placed well out of reach. In the child’s bedroom make sure their cot is not placed next to a window or curtain cords or in front of a radiator or heater. Bedding should be kept to a minimum. A cot shouldn’t contain lots of cuddly toys, extra blankets or bumper pads, as cute as they look they can cause accidental death or injury through suffocation or strangulation. When placing a baby in their cot, always place them on their back and with their feet to the bottom of the cot and tuck (cellular) blankets in firmly in at the bottom. This will prevent them from wriggling down under the covers and avoid suffocation and reduce the chances of sudden infant death syndrome (SIDS). You can also use sleeping bags instead of blankets. When purchasing make sure the neck is not wide enough for the child’s head to fit through. Have you ever noticed when chatting to your child how your speech changes? Does it become more slow and deliberate? Maybe you’ve wondered if this was the right way to address them, or perhaps someone has told you that you should speak properly to your child. Well, you are speaking to your child in a style of language commonly referred to as ‘motherese’, more recently ‘parentese’, and by linguists – child-directed speech or CDS. Thankfully we don’t need to learn motherese, it appears to happen instinctively when we speak to young children. The primary caregiver usually adopts the style of CDS when addressing their child. They will use a slower delivery, exaggerated intonation, and a higher pitch. The varying intonation and emphasis gently introduces children to language by getting their attention. If you don’t talk in this way, you’ll soon lose their attention and they’ll move on to something more interesting. Motherese gives children important lessons in the foundations of spoken language. The great news is that this is the best way to talk to your young child – linguists in the western world have collated a vast amount of evidence to show the benefits of CDS on children’s language acquisition. The first markers of a child’s verbal understanding begin when they are between nine and ten months old. At this stage the can reliably respond to a few words. Incredibly, by the time they are 13 months old they will understand around fifty words. The child is already building an understanding of its world in the few months before it speaks. It’s always fascinating to know your infant understands what you’re saying to them, but yet they may not be able to articulate a response. This is because their perceptive vocabulary (words they understand) advances before their productive vocabulary (words they can say). This is most pronounced in a child’s second year as they will be able vocalise roughly half of the words they understand. It’s hardly surprising that a child’s first words are the items of most importance – mamma, dada, biccie! A child’s first words will always be concrete nouns and verbs, which carry the important nuggets of information as a result of motherese. The parent will pronounce the nouns with exaggerated intonation. By around eighteen months of age, a child may produce around fifty words, but by around twenty-one months a child will have a vocabulary growth spurt and learn around ten new words every week. Evidence from researchers has shown this spurt in early words has been observed to coincide with developments in play behaviours. All of this demonstrates the importance of conversation between a child and his or her primary caregiver, whether it’s the mother, father or grandparent. This is because a young child spends most of their time with that person and may experience a limited number of interactions with others until they start nursery or preschool. It is important to immerse your child in conversation by talking them through your daily chores and errands, involve them in conversations by asking for their opinions. Pause and maintain eye contact to allow them time and to signal you expect them to respond. Encourage conversation at every opportunity – say hello to the lady at the supermarket and let them talk to relatives on the phone. For a young baby, encourage speech by teaching actions along with speech e.g. blow kisses, wave to say good-bye. A fantastic way to help your child’s language development is through play. Get down on the floor and have a tea party or take turns racing cars down a ramp! Play is vital for a child’s language development as their comprehension of words is facilitated by the associated actions. The best forms of play are those which serve to evoke a response from your child such as – role-play, games involving taking turns, looking at story books together and allowing the child to describe the pictures. Sing songs with associated actions, like itsy bitsy spider, ring-a-rosie or make up songs. This repetition and action will help to instil the meaning of the words. It may sound obvious but try to interest your child by asking questions about what they see in a story book. This provides them with an opportunity to learn and practise new words by telling the story themselves. An appreciation of how children learn language is both helpful and fascinating. You may have noticed how your child learns words through their associated qualities in terms of; shape, size, texture, sound and movement. E.g. anything round – tyres and biscuits may be described as moons, or anything on four legs may be called a dog! Or specs of dust, crumbs or anything small may be called ‘a fly’. Soft objects such as rugs, blankets and cuddly toys might all be called teddies for a time. A supportive environment with gentle direction, rather than telling a child they are wrong will help build upon their vocabulary. For how long is motherese beneficial? Motherese is beneficial as long as you continually develop your speech to match the pace of your child’s progression. Gradually expose them to more detailed grammatical speech as they are ready. Some experts think you should leave motherese behind when your child turns two, others think that it can useful for longer. Essentially, mothers know best and are the experts when it comes to communicating with their own children. Young children use language in a very similar way to their primary caregiver up until the time when they begin nursery. Then they use their own creativity and draw on a new broader range of sources and this will be reflected in their speech. This is where I currently find myself. We’ve gradually moved on from motherese as I’ve noticed if I talk to them like babies, they act like babies! Some parents of children experiencing speech development problems have been encouraged by speech therapists to adopt the style of motherese when addressing their child. However, if you’re at all concerned about your child’s speech development, contact your G.P. who can rule out ear problems and infections and refer you to a specialist if required. Originally published in Mums and Tots Winter Issue 2013. As a newcomer to the world of blogging, I have discovered a supportive community of mothers, all willing to share and support each other through their parenting dilemmas and all manner of highs and lows. Some do it with beautifully crafted prose, others through brilliant humour and some take the form of a daily journal. With genuine goodwill and refreshing honesty, they offer insights into their personal experiences of motherhood. Within parenting, they are each unique and occupy their own particular niche. They may focus on special needs, practical advice, recipes and crafts, or simply how they are coping with the daily challenges of parenting. Every blog is different with a special personality and writing style shining through. Together they create a huge body of experience with testaments from mothers all over the world. Blogging is accessible to everyone, and online platforms such as Word Press make it very easy for those who are new to it all. They offer free online tutorials and great support forums. For a small fee of around €24 you can purchase a domain name for the year (www.myfantasticblog.com). You can name your blog after almost anything you like, although a reference to what your blog is about is usually best, or like many, you can choose to keep it anonymous. As a (relatively!) young mother, I gain much reassurance from the blogs of experienced mothers and even grandmothers who have been there and done it all before. Here are just of a few of my favourite and most inspiring blogs which I currently follow and a few details on my own blog. I am an avid follower of Tric Kearney, an Irish mother of four. Tric, a very active and award-winning blogger, has gained much interest as she naturally possesses the gift of story-telling. Her honest and thoughtful words draw varying emotions from her readers as she records her daily thoughts and often asks philosophical questions about the ‘bigger’ picture. One day you may share her tears, the next, join her in roars of laughter, or perhaps reflect and appreciate all that you have. ‘And adventures with Sparrow and Pigeon’ is written by ‘Sparrow’, mum to 8-month-old twin girls, a writer and illustrator, living in an apartment in Brooklyn. Sparrow gives light-hearted and tenderly written insights and observations of her life as a new mum. She indulges her readers with her own beautiful illustrations of her twins, where she perfectly captures a fleeting mood or moment of her babies’ development. Katie, mum to two little boys, is a digital strategist living in Brighton. Hurrah for Gin takes a tongue-in-cheek approach and gives some light relief from the pressures of parenting. With her hilarious, anecdotal tales, Katie gives us her guilt-free take on motherhood as she laughs her way through problems and appreciates what she calls ‘the ordinary moments’. Look out for ‘The post-Christmas Devil Child’ – a hilarious post, I feel most parents can identify with! Drew is an impassioned writer in every sense, drawing on various creative media such as thought-provoking poetry, scholarly quotes and recently, her own photographic images to deal with moments of inner turmoil, reflect on her life’s journey and also share experiences from her childhood. Drew is a mother, grandmother and former foster mother, continually striving to perfect and refine her writing style and find her voice while inspiring and connecting with her audience. T.Dawn is mum to a baby boy and 4-year-old girl. In her blog she deals with a spectrum of issues, ranging from toddler tantrums, the postpartum female form, depression and how she is recovering from abuse she experienced in childhood. With an unapologetic honesty, she describes her daily emotions as she battles with some old problems. Occasionally melancholic and more often humorous, this blogger appreciates laughter is the best medicine. Last and definitely least! I am a new blogger and freelance writer. I use my blog ‘Put the Kettle On’ to share my experiences as a mum of 4-year-old boy and girl twins, to record poignant moments, both happy and sad, to promote my writing career; and of course for some free therapy..hearing feedback from other mums who can identify with me feels fantastic. Published in Mums and Tots, Spring issue 2014. As the proud owner of six chickens, two cats and a miniature Jack Russell, I see how much enjoyment they give to my four-year-old twins. My kids love playing fetch with our little dog in the back garden, feeding the chickens, collecting eggs and teasing the cats with string. They’re stimulated and kept busy by the constant interaction. And I feel secure knowing that my dog will yap loudly when anyone comes within twenty metres of my driveway. Our pets make our family feel complete and are a welcome distraction from the daily stresses, but they do require lots of our time, energy and money too! Before you make a decision on whether a new pet is a good idea, there are a few things worth thinking about. There’s no doubt a cat or dog will provide companionship for your children and can really become one of the family, as children commonly build strong bonds with their pets. In learning to take care of their pet, a child will develop an important sense of responsibility. If they are given simple tasks such as feeding and grooming, they will also develop humane attitudes such as empathy and nurture as they will come to appreciate the practical and emotional needs of others. Children who have pets are commonly thought of as less self-centred. These attitudes are important for a child as they will help them with their own social integration, for example, when they start school. A wealth of research has shown how pet ownership can help ward off depression, lower blood pressure and boost the entire family’s immune system. Walking the dog on a daily basis should be encouraged, providing an opportunity for the whole family to exercise and spend some quality time together. The death of a family pet can be a very difficult concept for a young child to rationalise. However, this experience will stand to them in later life and help them to cope in the eventuality of a friend or relative passing away. Think about whether your child is ready for a pet. Are they still crawling and putting things into their mouths? How do they behave around animals? Are they nervous or happy? If they are nervous around dogs, you could gradually expose them a friend’s dog who you know to be friendly and gentle. Despite how docile many dogs can be, their patience may be tested by an over-enthusiastic toddler constantly pulling on its ears and tail. If you have a young baby or toddler, a new puppy or kitten may be a lot to take on. Recent research highlights how children living in households with pets are 14% less likely to develop allergies, eczema and asthma in their first year of life than children who don’t. However, 30% of all asthmatics are already allergic to pet hair. If your child is asthmatic, suffers from allergies, or has had allergy testing done to show they are allergic to pet hair, it is best to avoid bringing a pet into the home. Rabbit, Guinea Pig, Cat or Dog? Although rabbits are popular, a pet guinea pig may be the easiest option for a first pet, especially for young children. They are relatively easy to look after, a less expensive option and literally offer great hands-on interaction for children as they can be involved in every aspect of its care. When considering which cat or dog breed would be most suitable for your family, speak to your veterinarian who will be happy to give you advice. If you are considering a rescue animal, make sure that the rescue centre know that you have children at home. They will have lots of experience in finding a pet well-suited to your family’s circumstances. The rescue centre may ask questions about whether your back garden is secure and whether there will someone at home with the dog during the working week. Some rescue centres specify that a dog should be allowed into the home and not kept outdoors all of the time. If you have a regular working week outside the home, there are now options to help take care of your pet while you are at work, such as dog walkers and doggy day care. If you do choose a cat or dog, make sure it has a quiet place to retreat to if it becomes overwhelmed by placing its bed out of the way. If young children are feeding the dog, make sure they do not touch the food bowl once it has been placed in front of the dog. Most dogs will become very protective of their food. Make sure your child reports any nipping behaviour right away. 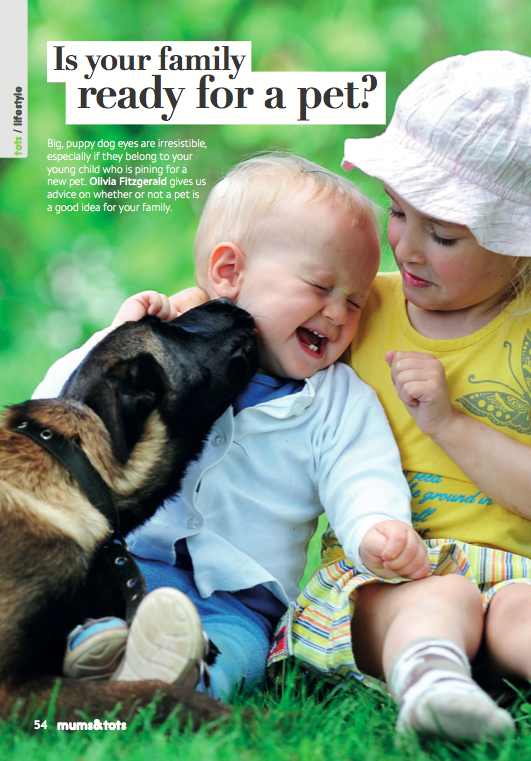 A staggering 75% of dog bites in children occur in the child’s own home with a dog that is familiar to them, and the average age of the child is just 5 years old. Kittens are a popular choice for young families as they require less commitment in terms or training and are less prone to behavioural problems. Cats are less likely to cause harm to a child, in the event that they are feeling overwhelmed they can readily escape, whereas a dog may bite if it is cornered and becomes anxious. Cats are naturally less dependent than dogs and may be a suitable option if you are at work during the day. An important note on hygiene – If you are pregnant, have another adult change the litter tray daily. Toxoplasmosis is an infection carried by a parasite in cats’ faecal matter which can be deadly to the unborn baby. If you do get a cat or dog it is very worthwhile to consider having them micro-chipped. A small micro-chip is inserted below their skin. If they are lost, a veterinarian or rescue centre can scan the dog and access an online database hosting your address and contact details. When having your dog micro-chipped, ensure this is carried out by a veterinarian who will register the chip with europet.net. Recently bogus databases have been set up, which are inaccessible to vets and hence the animal, if lost, cannot be traced back to its owners. Maintaining your pet’s health can be expensive. These necessary healthcare measures will prevent parasites, illness, and unwanted puppies or kittens which could otherwise ruin what should be a special experience for the whole family. Other expenses to consider are small accessories such as pet bed, bowl, lead etc. Food for your pet will also vary in price depending on the type and quality you choose. A guinea pig would cost only €10 per month, and a large breed dog could cost as much as €100 per month. If you’re undecided and need more information, the following organizations provide excellent advice on choosing and caring for a new pet. During my pregnancy I had brilliant daydreams of my new life with the twins, giggling babies lying on a blanket gnawing their fresh carrots, whilst chatting to friends over a glass of wine and cooking up a feast. Boy was I wrong! I was terribly naïve regarding the energy and effort required to look after twins and the strain it would put on my friendships. I really wish someone had told me. Well, that’s not strictly true, my GP did say ‘nothing will prepare you’. When the babies arrived I had an epiphany and felt incredible awe and admiration towards my friends who became mothers before me. I now truly appreciated the demands on their time and was grateful for their friendship. When my twins were born, I was inundated with curious visitors all vying for a peek, but after a few months and the initial shock and blurriness had passed, things went a little quiet. Of course this was largely attributed to my new busy schedule and unwavering disdain for late nights (in my world, caring for young babies and hangovers never happily co-exist!) I also wasn’t meeting my friends in the same places. I had given up work and withdrawn from many nights out and gatherings. Consider all the different groups of friends you have – work friends, friends that live down the road, someone you met at Pilates. If you were to change jobs or move house, after a while you’d soon notice how you had less contact with them. As our circumstances change, our networks of friends change also. However when we have a baby, the effect of these changes is much more profound. We may have (temporarily?) given up work, late nights and Pilates, all at once. This can have a very unsettling effect on your friendships. For these reasons, I witnessed my group of friends undergo some major restructuring. Thankfully, the majority of my friends have been really supportive, and only one or two weren’t quite on my wave-length. I realised as they hadn’t had babies yet, they had no clue what I was going through. And how could they? To expect them to understand is expecting a little too much. I recall being on the other side of this scenario, when an old friend, the first within our group, had her first baby. We all wondered where she’d gone and complained of never getting to see her. On the rare occasion that we did meet, she talked about her baby constantly. We were feeling a sense of loss. Although you have experienced huge changes in your life, it may take some friends a while to adjust to you and how you’ve changed. Don’t rule them out for dragging their feet in accepting your transition to motherhood. Hopefully these problems should only be temporary. Instead, try to empathise and remind them how much you value your friendship, and look forward to the stage when you’ll have a little more freedom to spend time together. Organise a babysitter and plan a girls’ night out. Some friendships may appear to cool off for a time, but they may rejuvenate, most likely when your friends begin their own families. They will have that ‘light bulb’ moment, look back and realise why you couldn’t find a baby sitter at such short notice, or can’t talk on the phone for more than two minutes. Then you will enjoy the position of mothering expert, a go-to for all their parenting conundrums! Armed with my massive changing bag (think Mary Poppins!) containing two clean outfits, two bottles, two soothers, two cuddly toys, wipes, snacks and a million nappies, I was ready to get back out there, babies in tow to meet the girls. We had our share of misunderstandings. One friend couldn’t see why meeting for lunch at a nice restaurant with two babies would never work (my meal would go stone cold and I wouldn’t get a chance to eat it), or why I couldn’t wait until Friday night for her decision on whether to meet on Saturday afternoon. Some couldn’t grasp how impromptu gatherings belonged to my previous life. I was baffled by another friend’s behaviour – she called to see me, and whilst elbow-deep in baby, we attempted to chat. It lasted all of five minutes. ‘Oh I can see you’re busy, I’ll come back another time’. I thought ‘when are you going to come back? This is kind of the way things are now!’ I knew she was uncomfortable when I asked if she’d like to hold one of the babies – she glanced down to make sure she was wearing old clothes that day! I wondered why she didn’t get it. After she regaled me with stories of how busy she was and how she never intended on having babies, she left and I haven’t seen her since. How could she not appreciate that hidden underneath the unkempt hair and baby paraphernalia, her old friend was dying to hear her news? As difficult and hurtful as it was, I have had to accept her resistance and allow the friendship to fade. I’m sure you’ve heard on more than a few occasions ‘welcome to mummy club!’ And it’s true, upon entering motherhood, you are granted instant, privileged access to an entirely new network of people, whom you might not previously have spoken to or had anything in common with. Say hello to your new friends. A trip to the playground or mother and toddler group (or almost anywhere!) creates a great opportunity to strike up conversations with other mums. I remember my first encounters and it seemed rather odd but lovely too. I can’t think of any other situation where it’s so normal and almost expected to start chatting with those around you. If you are feeling isolated and lonely, try chatting with another mummy, chances are she’s dying for a chat too and you’ll have lots in common. This is a brilliant way of making new friends and if your children are of a similar age, you’ll always have shared experiences. I’ve met some lovely, like-minded mummies since my kids have started pre-school, even another mum to boy and girl twins! Early motherhood can be a lonely and challenging time for mothers, so it’s important to maintain the valuable friendships we have. Friends can help us navigate through the stressful times, we can compare notes when our children are ill or simply help each other not to worry so much! The majority of our friends have most likely been incredibly supportive and we shouldn’t take them for granted. Take time for yourself to socialise with your friends, even if it’s only once a month. You’ll feel the benefits and this will help prevent resentment building when you pine for your old life! Despite all the comings and goings I have found that I have more friends and stronger friendships in comparison to my pre-baby life. I can confidently say ‘I know who my friends are’. (Originally published in Mums and Tots, Winter Issue 2013). If you intend to breastfeed your twins, invest in a good breastfeeding support pillow – I used the E-Z twin pillow. You will save time by feeding both babies at once, and it will help prevent back strain. Choose anti-colic feeding bottles. They may be more expensive but you’ll have happier babies. Research which nappies are best and don’t settle for the cheapest on the market – this will lead to more leaks during the night and sleep disturbance for all of you. A good routine is crucial with twin babies. Encourage each baby to nap and feed at the same time. If your babies are premature (thirty-seven weeks is average) they may take longer to settle into a routine, but once you succeed stick to it, except when a baby is unwell. If the babies are being fed at different times, life can become chaotic and you may forget who was fed last. If the babies are unwell and receiving medication – keep a note in a diary of who received what and when. It’s very easy to overdose twins especially when they’re identical and you’re suffering from sleep-deprivation. Like many mothers and fathers everywhere, I will shortly be saying goodbye to my babies, sorry, children as I drop them off for their first day at Montessori. With dread, I have been counting down the years, months, and now weeks until they will leave my care to attend the local pre-school. I honestly can’t understand why I am finding this particular milestone so irritatingly difficult. In their short lives of 3 and half years, my twin boy and girl have achieved many milestones, big and small (admittedly this is one of the biggies). And I can remember so many occasions where I fantasized about a break from the little darlings, for someone else to take the reins, change nappies, or buy groceries so that I could enjoy a hot cup of tea as opposed to stone cold, or make a casual visit to the hairdressers rather than a military style operation planned weeks in advance. Originally published in Mums and Tots Autumn issue 2013. I can surely relate to this even though it has been a few years back. Now it is with grandkids. My friends wonder how can I do it. I am a mummy person and know that my daughter needs a break here and there. Sometimes once a week or everyday, depending on what she is working on. I try to be there for her and her hubby, and so my friends leave me to myself doing what I choose to do. Your daughter is very lucky. I hope she appreciates you! I got a great response for this article, thankfully many mums can relate to it. It’s comforting to know others are going through, or have been through the same thing.